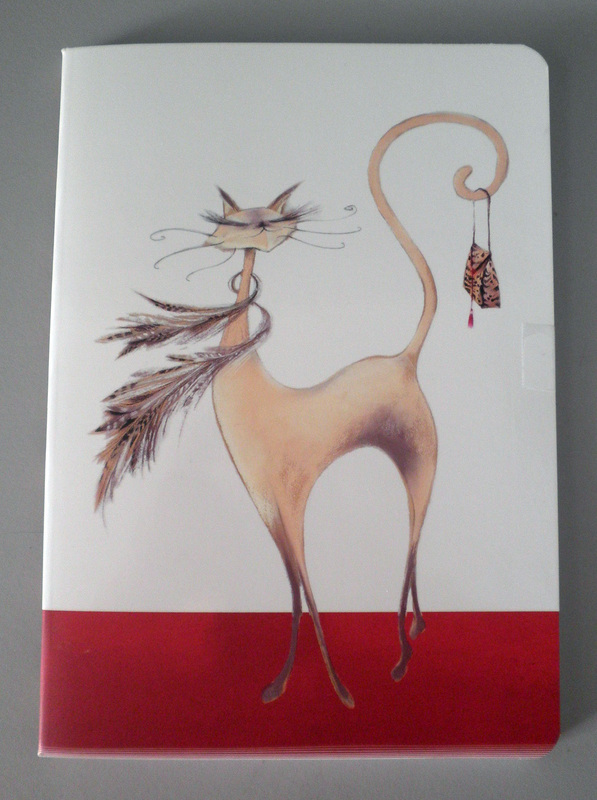 Several weeks ago I ordered some new notebooks from Writer's Bloc, including two of the new Clairefontaine Cat Journals. While I didn't get to choose the journal covers, I liked them all so it didn't really matter (I imagine if you have a preference you can email a request). When I opened the package I saw the lovebirds in the first picture and the cutie above, looking as if she's about to hit Saks Fifth Avenue and Bergdorf Goodman any minute and would I mind opening the door of her Town Car for her? Now that is Catitude! 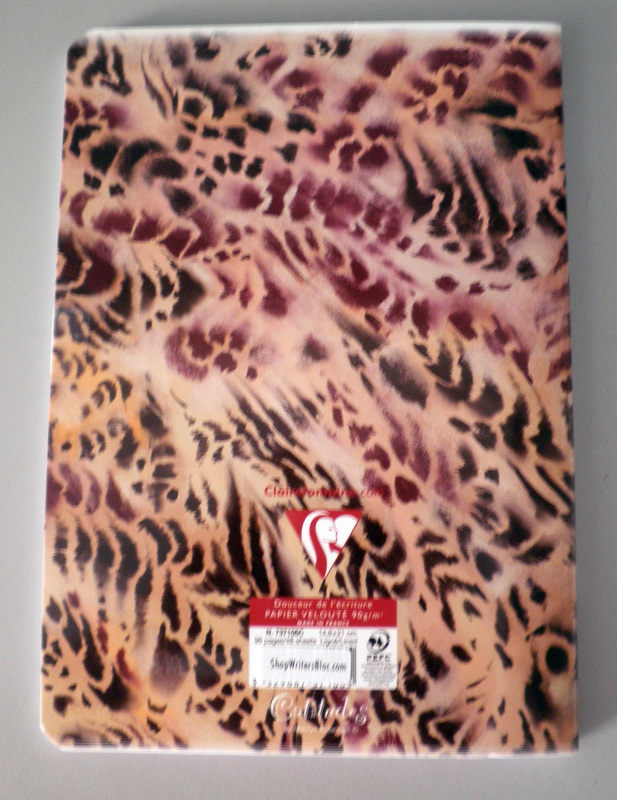 The back of these journals have animal prints of varying designs, making this a nice looking journal front or back. 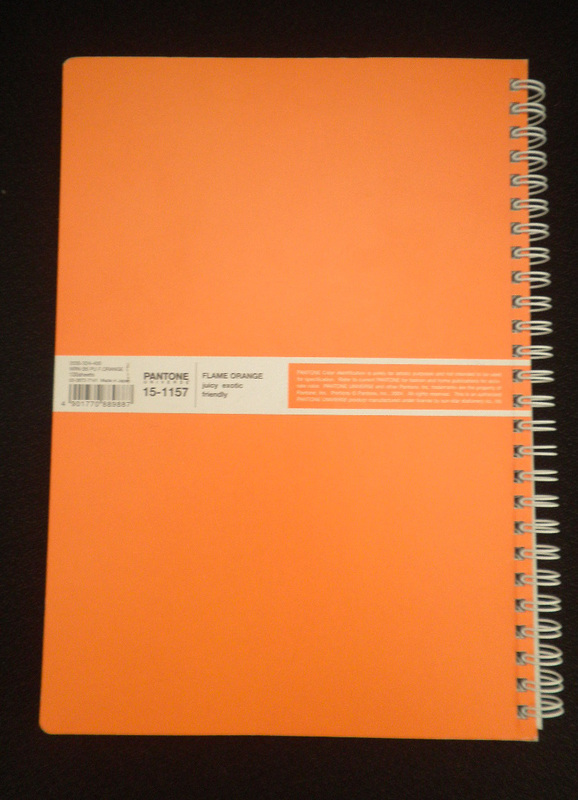 It's Clairefontaine, so you get 96 pages of 90gsm bright white paper. I haven't tested the paper as I'm still undecided as to which one to give to my friend, but it's good stuff as many of us know. 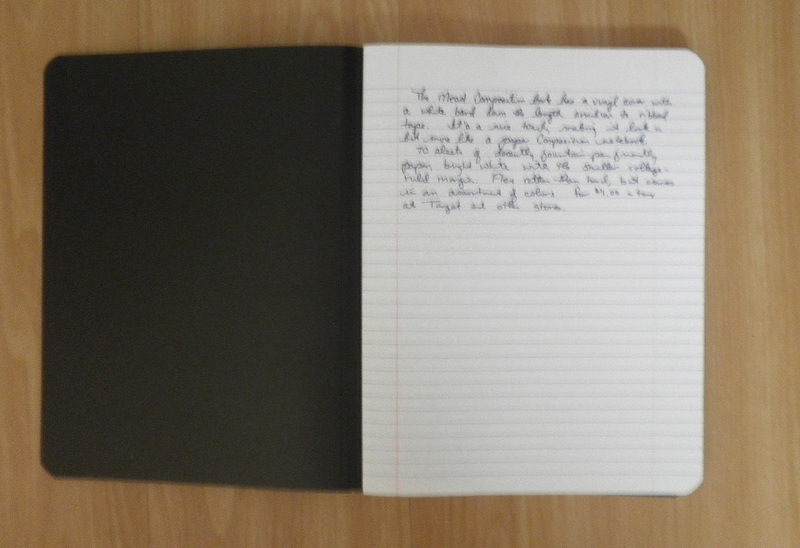 I like the wide lines of this journal and the rounded edges at the corners, and I like the size as well which is 8.25 by 5.75. 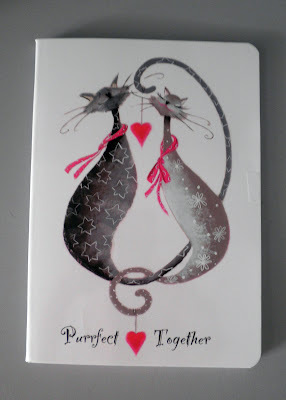 If you like Clairefontaine and cats and lined/ruled notebooks check these out, they are inexpensive ($5.25 each) pleasures that brighten the day. Moleskine's Passions series includes Dog and Cat Journals, and while I've been tempted by the latter I haven't taken the plunge yet. 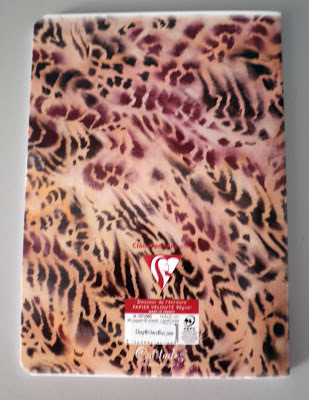 But Julie (Okami) at Whatever has decided to try out the Dog Journal, take a look at her review and pictures. 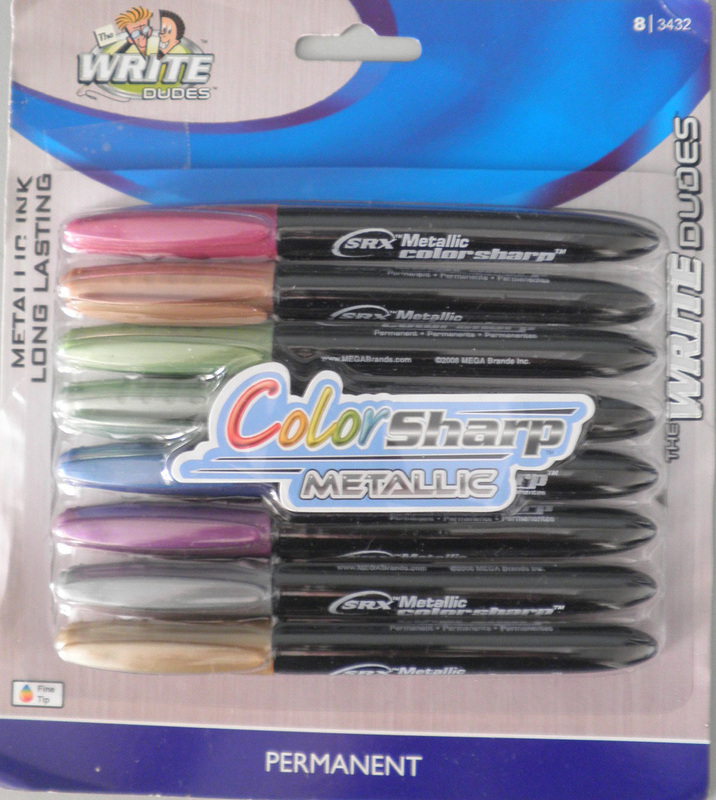 Another Target purchase, and something I don't tend to use much but liked the look of, was this set of Colorsharp Metallic permanent markers. While they strive to imitate Sharpie, the Write Dudes don't quite make it on at least one important level: the tip of the marker is spongy, not firm like a Sharpie, so you can't really write with these. They are more for writing large letters or for coloring a lot of space, but not really for smaller, finer work that requires a firm-tip marker. That said, the colors are really beautiful, especially the two greens. Including gold and silver in the set may be considered cheating (they are metallic by their nature, not by chemical wizardry) but the other colors really are nicely metallic with looking harsh or cheap. 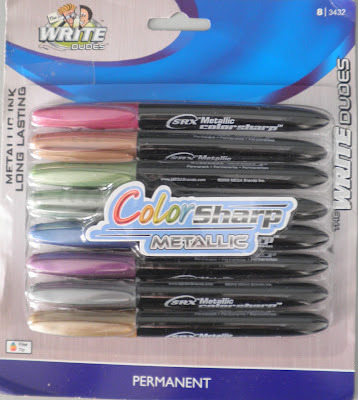 Eight different markers for around $5 is a great bargain, though I'm not sure how I'm going to use these (playtime in my blank notebooks most like it). EP of Economy Pens has several posts on Write Dudes highlighters and pens, take a look if you're interested in more from this line. A.I. Friedman on West 18th Street has a great selection of Moleskine products, including many of their bags and other accessories (sunglasses, small cases, and the specialty Passion journals). 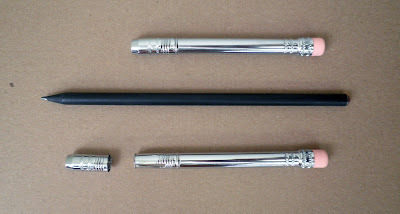 Among their stock is the Moleskine Rollerball Pen, both the black plastic ($14.95) shown above and the metal rollerball ($49.95) which comes in its own crafted case. It's a great design that will fit on many journals, the pen cap is open on one side to slip onto the edge of the journal cover. This is one of the darkest black inks I've every used (and it is proprietary to Moleskin); while it goes on very wet (you can see the shine as you write) it dries within a few seconds. 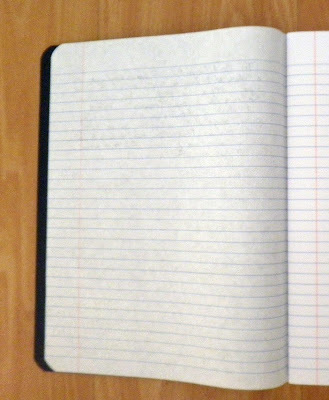 I was surprised that the ink leaves a shadow on the Moleskine paper, so while there is no bleed through you still may not be able to write on both sides. The pen comes in a 0.7mm wide and the one I'm using, a 0.5mm fine tip. The line seems about right, not too wide or unwieldy. 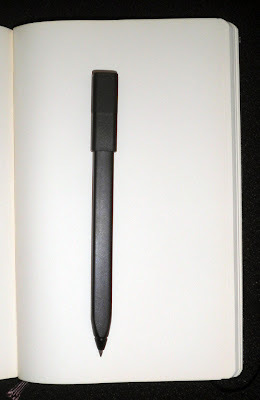 The pen itself is slim and rectangular, reminding me of a carpenter pencil. It feels a bit strange in the hand, too wide and hard-edged rather than round with a soft grip like my other pens. A side view of the way the pen looks attached to a Moleskine journal. It's slim profile and matte black plastic actually allow this pen to blend into a black journal like the Moleskine. As it disappears, you don't notice it until you go looking for a pen to write with. The Moleskine Rollerball is certainly priced competitively with other higher-end rollerballs, and is made specifically to attach to a journal--the one time you really need a pen at hand. Definitely a fun product with an elegant design, take a look if you are thinking of adding to your collection. Saw a pack of Paper Mate Profile ballpoint pens at Target and was interested when I saw the 1.4mm broad tip. That's really wide, more so that I normally like, but I was interested and decided to give it a try. The Profile actually is made in the profile of any number of great pens such as the Pilot G-2 and the Zebra Sarasa: curving clip, rubber grip, clear barrel. One tiny design difference is the plunger, which has a rounded, clear smokey tube over the actual hard plastic plunger that gives the top a curvier appearance in keeping with all the other curves on the pen. This is one of the smoothest ballpoint pens I've written with, the specialty oil-based ink flows like a gel ink. I didn't notice any blobs of ink or smearing, but I've seen reviews online where that has been a complaint. 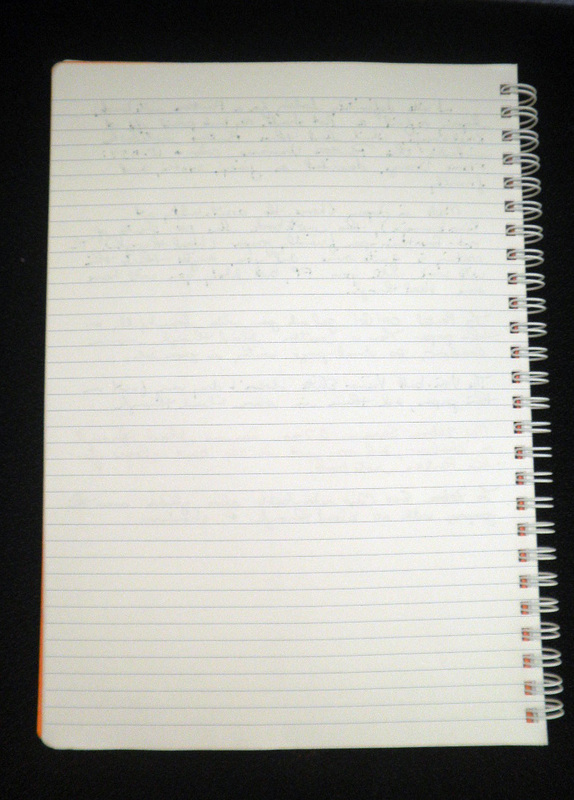 The 1.4mm broad tip makes for large, clear writing. The metal tip is much bigger than the ones I normally see on my gel ink pens, but even a few of my ballpoints are no where near this one. As an example, I wrote with some of my favorite pens to compare the line width. 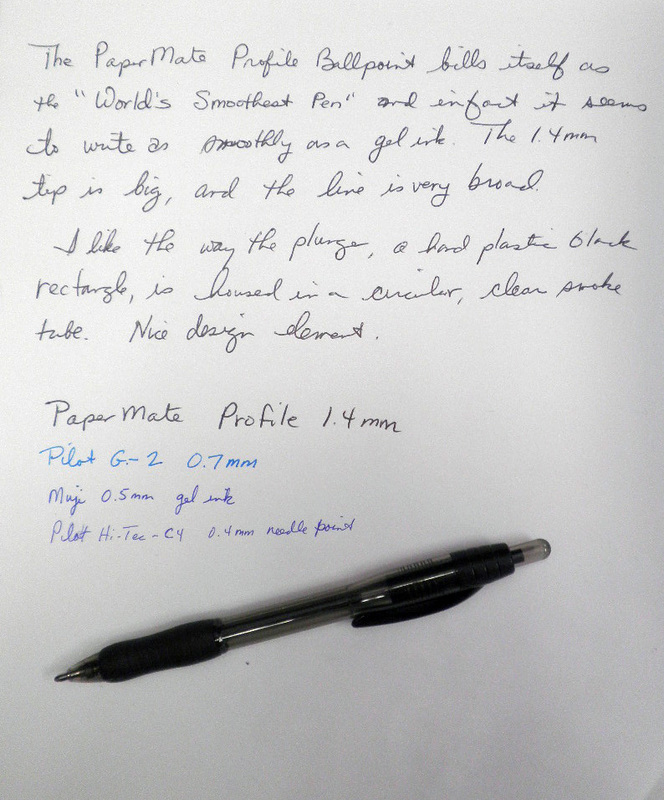 If you need a bigger line, the Paper Mate Profile is something you want to check out. Reading this post over at Dave's Mechanical Pencils had me wondering where I could find Pantone Universe supplies like this, particularly a notebook. When I went online to Pantone I couldn't find any information about notebooks, much less mechanical pencils, so I figured I was out of luck. 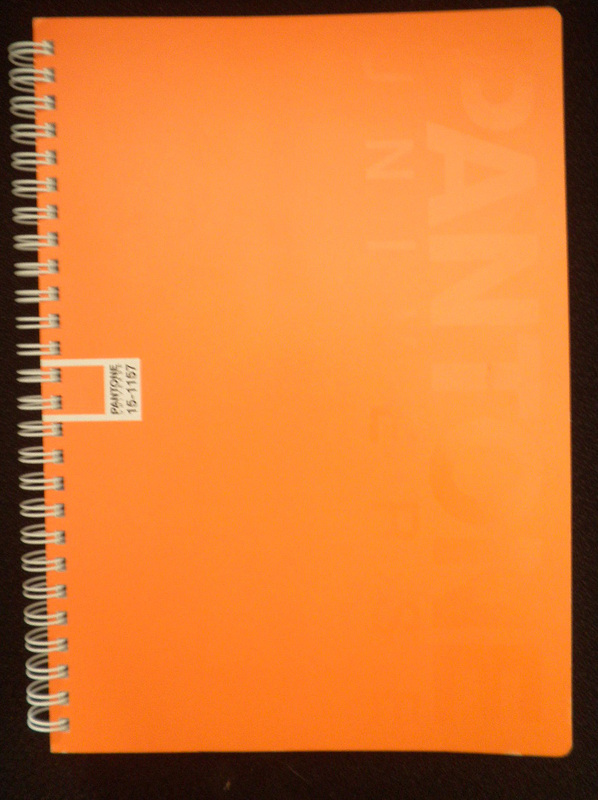 Then I noticed these really interesting notebooks tucked away in a corner at Kinokuniya, and discovered this one, a Pantone Universe notebook in Flame Orange (15-1157TCX in Pantone Code). According to Pantone this color is jucy, exotic, and friendly, all of which I would agree with, along with bright and lively. You can't see it in the first picture above, but on the right side are the words Pantone Universe glazed into place against the matte orange cover. The back, pictured above, gives you the color code information. The Pantone Universe notebook is made in Japan, an interesting 7in. X 10in with 100 pages of bright white paper. I like the white double rings next to the bright orange color, the combination reminds me of a vibrant creamsicle. The paper itself is quite good. 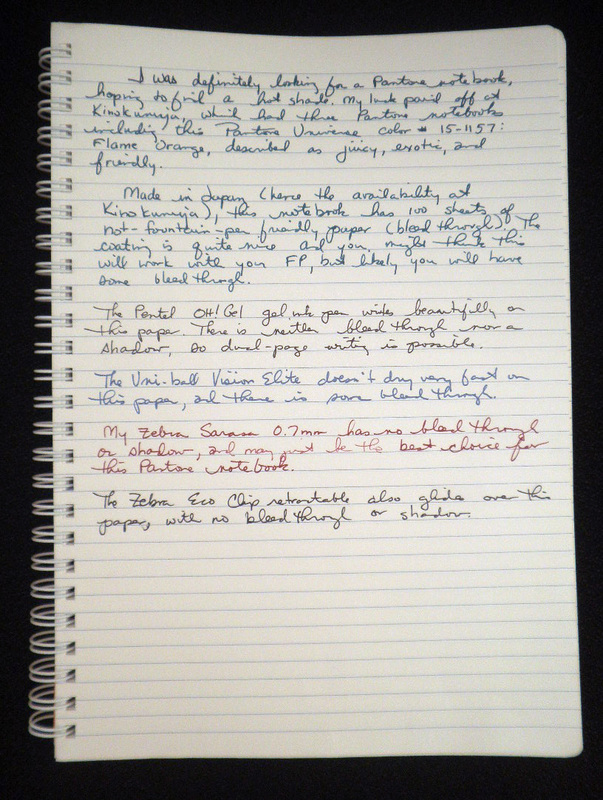 It's not especially fountain pen friendly, and as you can see there is some bleed through on the top writings. 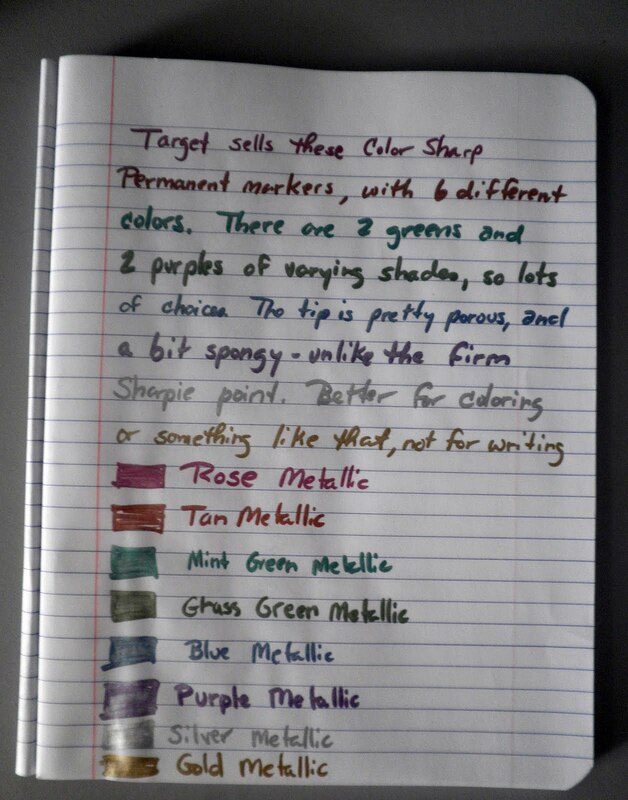 Gel inks work well, especially the Zebra Eco Clip I used in the last sentence. What was equally of interest was the price: $7.95 for the notebook, which is quite reasonable for a specialty product like this. Given that Kinokuniya's pricing system is a bit idiosyncratic (paper products tend to be cheaper than at JetPens, but pens and other writing instruments tend to be a lot more expensive--given it's a brick and mortar store I would have expected both to be higher, not just the latter), I'm not sure if that's within the expected range or not. If you can find any of these (or can point me towards a source), do give them a try. The cover colors alone are worth it. I am certainly thinking of getting one of these, not because it's better but it's certainly cooler than the ones I already own. Great post by Office Envy of Poppin's New York City headquarters. You still have time to enter Rhodia Drive's Dot Webbie giveaway, but you have to enter by Midnight (EST) tonight. Hurry over and submit your entry. Back-to-School supplies are all over the stores now, though I didn't really notice until shopping at Target a few days ago and coming across aisles and aisle of different styles of Mead notebooks. 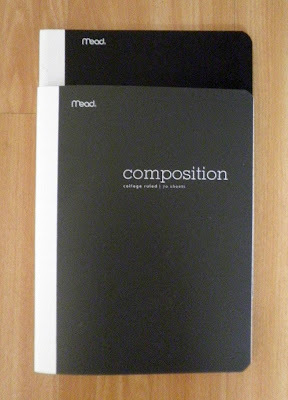 This vinyl update on the standard Composition Notebook caught my eye (they come in an assortment of neon colors as well) for their minimal design and color: gray and black, with white cloth-style side binding. The notebook is 9.75 x 7.50 inches, and has 70 college-rule sheets of bright white paper. It is totally flexible, so writing has to be on a hard surface. 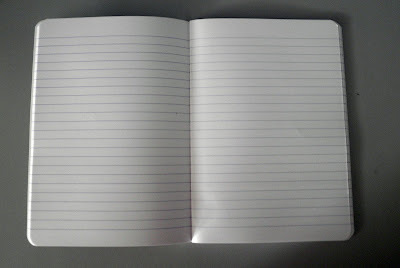 In fact, the notebook is so flexible you could roll it up if you want to, reminding me of certain flex notebook like Zequenz roll up journals. The paper is of fairly good quality. 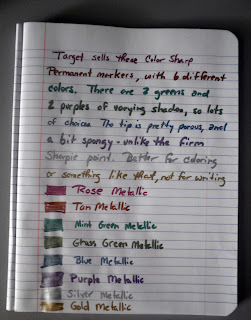 There is some bleed through with fountain pen ink, but overall it does well with gel ink. For $1 and tax (9 cents), this is a great buy for keeping notes, doodles, stray thoughts, and whatever else I'm thinking of jotting down. The other colors (neon blue, pink, and green) didn't interest me, but it you're into bright colors then check out the vinyl Mead Composition notebooks. The Color Of is a web site that attempts to find the color of everything. Type in a word (like "frustration"), wait a few seconds, and you'll find out what color it is (grayish-black with some interesting streaks). Tiger Pens has put together links to some of the latest blog posts here, take a look at the great writing (yours truly included). Margana, the proprietor of An Inkophile's Blog, has posted a great review of the new Platinum Mix Free Inks. These are definitely of interest to me, and the pictures are magnificent. Definitely take a look. One of the most interesting ideas I've come across is Lost Crates, a "stationery-of-the-month" club of sorts where you sign up, take a short personality quiz, and then receive stationery and other office supplies on a monthly basis. You get an assortment of notebooks, pens, pencils, and many more items every month, and while you can't choose what goes into your crate you can be assured of a great selection of products. 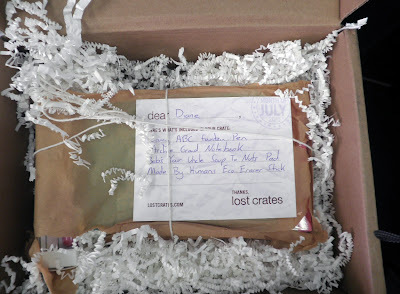 Sara Ostman, Communications Analyst at Lost Crates, very generously offered to send me a sample crate to try out and I'm very grateful to her (and Danny, the founder) for the chance to review both the concept and the contents. 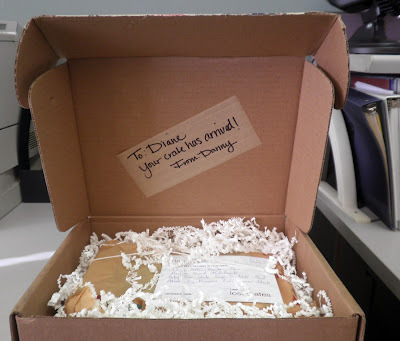 As you can see from the above picture, the boxes are sturdy and there's a wonderful personal note inside (thanks, Danny!). I like the idea that this company is small enough, or just interested enough, to hand write notes. 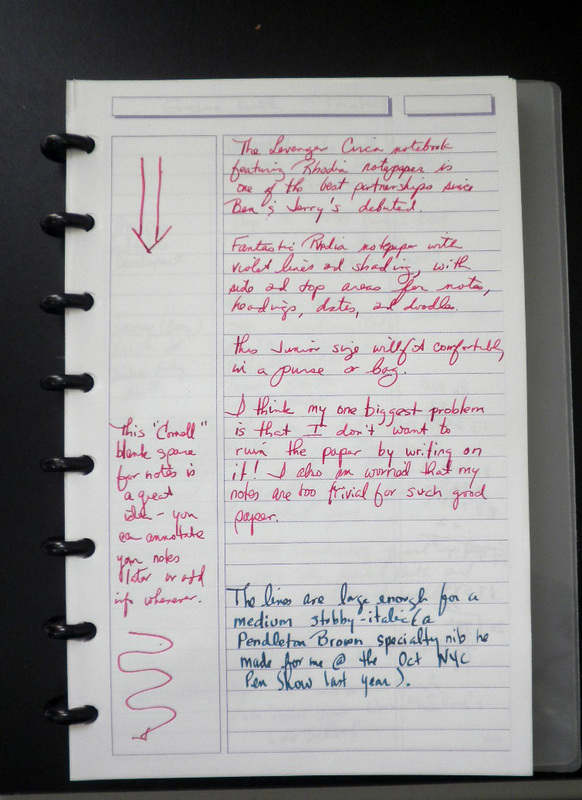 Notemaker does this as well and I find I really like this extra, personal touch. Lost Crates makes sure everything is wrapped securely and packaged so that nothing can get dented, ripped, or broken. The old-fashioned brown paper wrapping tied with string comes straight out of the 19th century, and is charming. I also like the label, which lets you know exactly what's inside. Finally, there's the shipment. This one included a fantastic Archie Grand notebook in turquoise (one of Pantone's recent color-of-the-year choices) with the inscription "Lies I Told And Liked" front and center. This particular notebook had different paper than the one I reviewed a short time back, smoother rather than pebbled and bright white. It looks like a real conversation stopper as well as a great notebook, and I'm looking forward to using it. 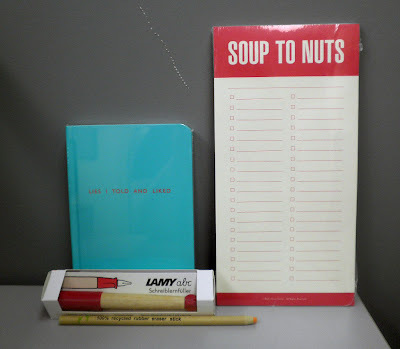 a Bob's Your Uncle Soup to Nuts tear-off note pad with lots of space for shopping lists and blocks for checking off purchases. Lost Crates is a great idea, and while I am a bit hesitant about the $38 a month price (it seems so much!) I have to admit that the total amount of the items I received was well over that. So I've decided to take the plunge and become a member. I'm looking forward to receiving a monthly box, and likely will blog about the crates and their contents in months to come. I'm also interested in how the personality quiz changes the contents and will likely play around with that from month to month. In my first quiz I chose, among other things, paisley and steak ans two favorites. This new quiz, I changed to ice cream and chintz. Can't wait to see what my next crate looks like! I would guess that if two people wanted to split the cost of a Lost Crate membership, changing the quiz on a monthly basis (or adding other personality clues in the blank space at the end) would make the boxes more personal and interesting for both people. It's certainly something to think about, if you're mulling over membership. 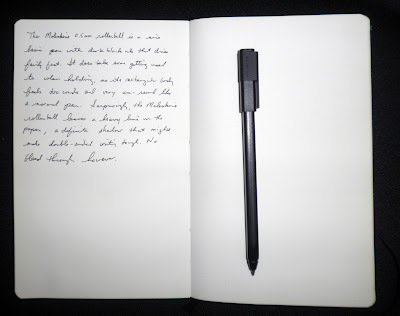 Julie (Okami) reviews the new Rhodia Dot Webbie over at Whatever, take a look. This looks really nice, it will be next up in my lineup to buy (when I finish up all my other journals, which could be awhile). Gerald Ford was a zombie controlled by Richard Nixon? That actually makes sense. Due to the state shut down in Minnesota, beer/liquor and cigarette sales may come to a crashing halt. Weird consequence, since two of the biggest revenue streams for states tend to be the "sin" taxes. I saw this set of STAD pencil holders at Kinokuniya and was taken by the design, a long silver holder with a large pink eraser on the end. It's simple, yet it has some complexity to it: the top piece unscrews and the pencil slides in (there are cuts on the side so the holder can expand if the pencil has a bigger diameter than normal), then the top screws back on to secure the pencil. I don't have any pencil stubs to try with these, so I had to make due with almost full-sized pencils. I like the large eraser on the end, but it does make the pencil holder look more at home in a grade-school than a corporate setting. While this looks bulky (the eraser on the holder is about twice the size of a standard pencil eraser), it doesn't feel that way. The silver metal looks thin but it isn't--I've applied pressure to try and dent them a bit and can't do it. I imagine I'd have to step on one to really do some damage, so they are as sturdy as they look. I don't see them at Kinokuniya's online store, Maido, but JetPens has a STAD One Push Pencil Holder available. Unfortunately these may be a "bricks and mortar store" only item, which is a pity as they are definitely fun to have around. 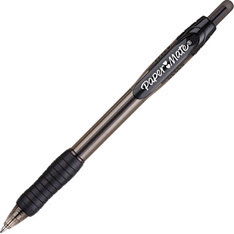 A great review of the Uni-ball Power Tank Ballpoint Pen over at The Pretense of Knowledge. 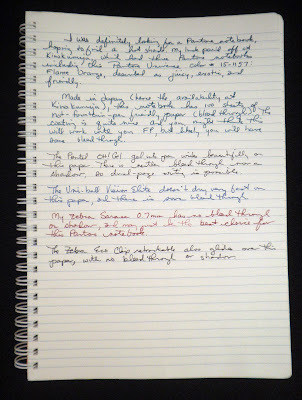 I've come to like using Sheaffer Skrip blue ink, it's a brighter blue with quite a bit of purple in it (the above pic is a fairly good capture of the color). Skrip is easy to find and comes in the standard array of colors (black, blue, red, green), but there is something about this blue that makes it stand out from the rest of my blues. It has a glow to it that I don't see in the J. Herbin Bleu Nuit, which is another "benchmark blue" that I use for color comparison. It also shades and covers well, with a lot more pigment than I expected. The Skrip blue ink dries very fast, which is another plus. It isn't waterproof, but I've rarely needed that feature in any of my inks (never, actually). It's readily available, and looks good on paper (or fingers, if you slip while filling as I do). There's a lot to like in this ink, definitely give it a try. I've been looking at the Levenger Rhodia Circa Notebook for some time, and finally went with a Junior, as it seemed to be a handbag-friendly size. 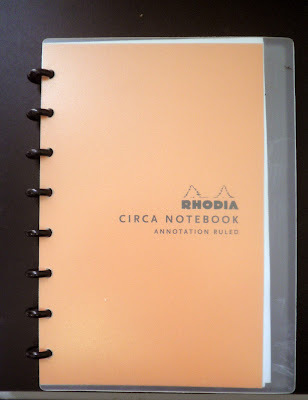 The entire assembly is fun, with larger, clear front and back covers that keep the orange Rhodia cover from becoming worn out while also making the notebook a bit more sturdy. 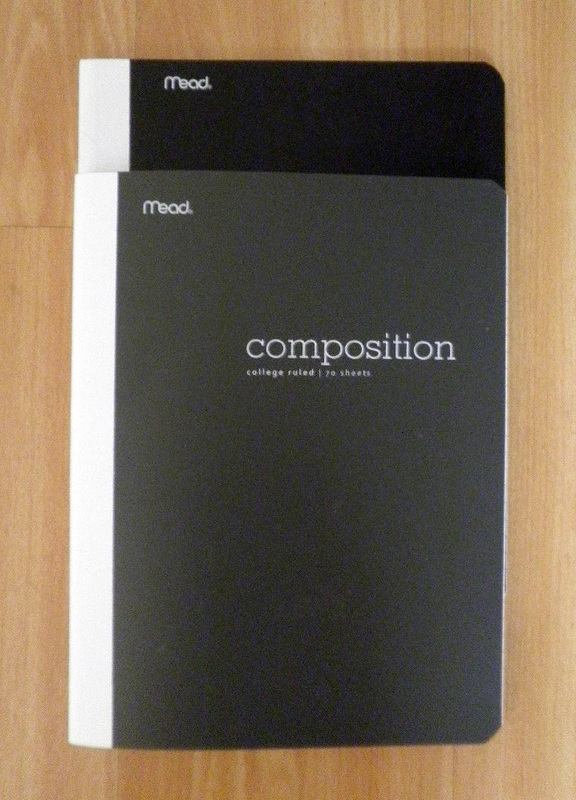 It's not a hard cover journal by any means, but it's a great-looking notebook that stands out. 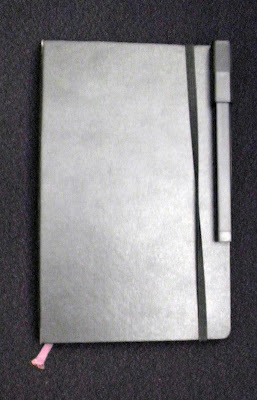 The Junior Circa has lots of different numbers: the outer, clear cover measures 8.75 inches long by 6.5 inches wide (measuring from the outside of the disc so as to have a truer measure of width). The paper 8.5 by 5.5, basically a nice sized journal. The left-hand blank annotation column measures 1.25 inches wide, so you have a lot of room for additional notes or doodles or whatever you want to add to your original musings. The paper is fantastic, the Rhodia 90gsm satiny-smooth paper that's fountain pen friendly but not overly bright white. I like the pale violet lines, especially the shadow effect at the top where you can write in headers and dates (or whatever you want). The side column is a fantastic addition, utilizing the "Cornell" notetaking method for annotation. I like to doodle in the column, but also find it helpful when I've left out something or haven't made my thought clear and need to work on it a bit more. I love the way these discs work, keeping the notepaper in place firmly but not rigidly. The paper doesn't come out easily, but actually pulls out in a smooth, gliding motion without any ripping or shredding of edges. So there are no unsightly tears on the pages, which can be moved around or tossed out. 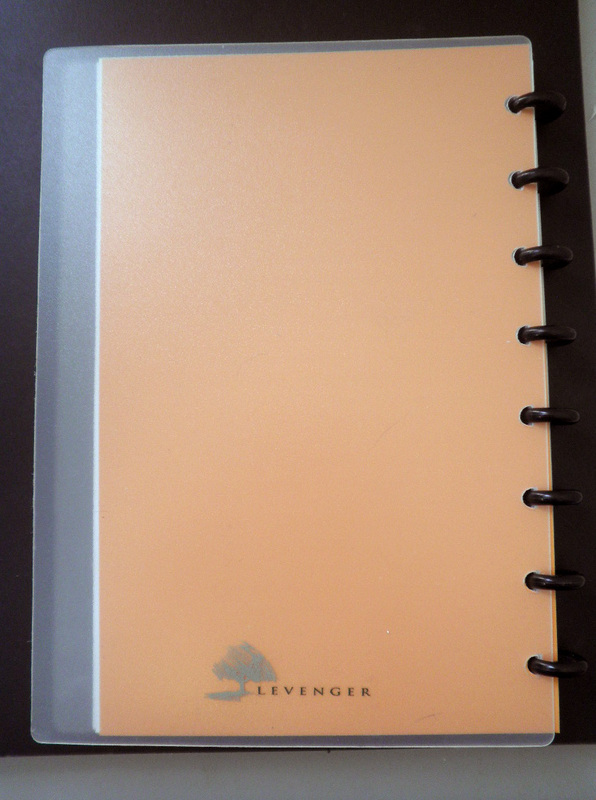 Finally, the back cover carries the Levenger logo with a green tree. While it's not a pine tree, it's a great design detail that reminds you of the company without any blaring commercialism. This combines Rhodia's great quality and well-known orange color with Levenger's ingenuity, and I've been thrilled by the way both come together to make this a fantastic notebook. Can't believe the Carnival of Pen, Pencil and Paper is here already, hosted by Notebook Loves Pen. Go check out the great posts, lots to read and enjoy. One of my co-workers is leaving for greener pastures, and as he also happens to have been my assistant for the past four years I wanted to get him something special. A fountain pen wouldn't work too well, but then I saw this Zebra Clip-On multi at Kinokuniya, with four pens and a pencil, and decided to go for it. I should note that D stands 6 ft 4 inches tall and has large hands, so while a Hi-Tec-C would be my first choice it would probably look like a toothpick if he used it. The rollerball pens he uses tend to be big, like the Staples Opti-Flow. So a big pen would be in order, and since he's a writer I thought a multi pen would be a great gift. When I saw the Zebra Clip-On Multi 2000 I knew this would be ideal for D. Kinokuniya had several color choices, and I decided on the matte black (the matte red was beautiful but a little showy, and the silver didn't impress me at all). I also decided to take a few pictures and give it a test drive on some 80gsm bright white paper. 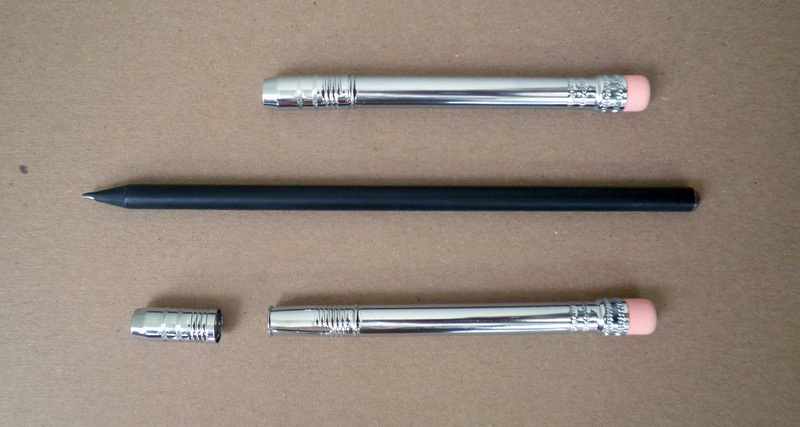 This is a big pen, and as JetPens notes it is the high-end version of the standard Clip-on multi. The black matte body is still plastic, but thicker and more substantial although it isn't very heavy in the hand. There are four different 0.7mm ink colors (they look smaller in the writing sample, more like 0.5mm or less) and a 0.5mm pencil that emerges when you push down the clip. The eraser is underneath the cap, keeping it safe and invisible. Trying the ballpoints on a Rhodia notepad, I thought the colors were a bit pale, but that may be due to the vibrant fountain pen inks I tend to use rather than a dilution of the oil-based color. The pencil takes a bit of getting used to, as it descends via plunging the clip--which is also how the lead feeds into the pencil. Pushing down on the clip brings the pencil down but may also give you half an inch of lead you weren't expecting to see. This is definitely one of the nicest multi pens I've ever seen, although my Hi-Tec C pens will always take first place. It makes a statement by it's size and looks, the black matte finish reminding me of certain "stealth pen" models but at a much lower price point. The Zebra Clip-On 2000 is durable-looking yet its design is pretty spare except for the clip, which is substantial yet somehow lean and elegant. If you like multi pens and are interested in adding to your collection, give this a try. Coming out of Kinokuniya on Saturday after some morning retail therapy, I was standing under a work shed at the NW corner of 40th Street and Avenue of the Americas (6th Avenue) when I spotted this sign. I don't recall seeing this before, and didn't know that Tesla lived (or worked) in the area. According to the Tesla Memorial Society, Tesla received The Edison Medal in 1917 at The Engineer's Club located at 34 W. 40th Street near Bryant Park. So the city designation is commemorating that event, rather than a residency or workshop space.